Rapid PT Program: Does the Western Diet and Lifestyle Cause Disease? 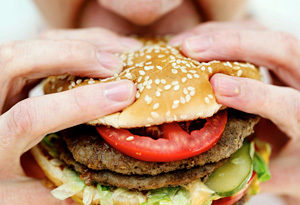 Does the Western Diet and Lifestyle Cause Disease? Heart disease, stroke, obesity, and diabetes are not diseases that humans normally experience. (1) These modern diseases have only become more prevalent within the last 100-200 years, and only within populations that have adopted the Western diet and lifestyle. So, what have we changed within the last 100-200 years? Refined sweeteners like sugar, corn syrup, and high-fructose corn syrup. Engineered foods that come in a bag, box, or can. Plant toxins and anti-nutrients from industrially-processed wheat and soy. Omega-6-rich polyunsaturated oils from nut and seed oils. Chemical food preservatives and taste enhancers like salt and monosodium glutamate. Calories from energy-dense cereals like wheat, millet, oats, and rye. Pasteurized dairy from specially-bred cows fed grass clippings, grains, and ethanol waste. Nutrient-dense foods like organ meats, root vegetables, and fruit. Seafood and shell fish like salmon, shrimp, and clams. Raw dairy from cows that freely graze on green grass. Fermented foods like yogurt, kefir, and kimchi. High-quality protein from vegetables, animal meats, and raw dairy. Chronic stress, which elevates hormones that remove lean mass, add fat mass, and accelerate aging. Alcohol intake (alcohol is a conditional risk factor, which I will talk about in a later post). Cigarette smoking (smoking is also a conditional risk factor, which I will talk about in a later post). Physical activity, which reduces our lean muscle mass. Sunlight Exposure, which reduces our vitamin D levels. Sleep, which elevates hormones that remove lean mass, add fat mass, and accelerate aging. You also have to understand that the odds of developing disease are relative in our Western society. As a category, people who are defined as having a "healthy" diet and lifestyle in a Western population will generally have lower odds of being afflicted with heart disease, stroke, diabetes, obesity, or cancer when compared to other less "healthy" people living in the same population. Clearly, as far as disease is concerned, there is a HUGE difference between the diets and lifestyles of Western and Traditional populations: One causes disease and the other doesn't. 1. Lindeberg, Staffan. Food and Western Disease. UK : John Wiley and Sons, 2010. 2. The Western Diet and Lifestyle and Diseases. Carrera-Bastos, Pedro, et al. s.l. : Research Reports in Clinical Cardiology, 2011, Vol. 2. 3. Aging-Associated Diseases. Wikipedia.org. [Online] [Cited: November 19, 2011.] http://en.wikipedia.org/wiki/Aging-associated_diseases. 4. Jaminet, Paul. Perfect Health Diet. s.l. : YinYang Press, 2010. 5. Price, Weston A. Nutrition and Physical Degeneration. La Mesa, CA : The Price-Pottenger Nutrition Foundation, Inc., 2008.